Recent Chinese military maneuvers in the Bashi Channel had only one purpose. The People’s Liberation Army (PLA) has recently been practicing the invasion of Taiwan with a number of joint air-sea military exercises in and around the Bashi Channel, in close proximity to Taiwanese territory. As I reported last week (see: “China Holds Naval Drills Near Taiwan and Philippines”), the most recent exercise involved the simulation of real combat conditions in the waters east of the Bashi Channel, including long-range precision strikes and aerial combat. 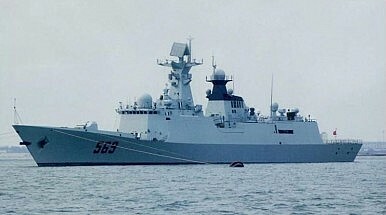 According to IHS Jane’s Defense Weekly, the Chinese naval task force consisted of a Type 052B destroyer, a Type 054A frigate — side note: two ships of this class also recently participated in a joint Sino-Russian maritime exercise — and a Type 904 general stores issue ship. The People’s Liberation Army Air Force (PLAAF) deployed a number of H-6G/K strategic bombers and J-11B air superiority fighter jets. The H-6K can carry six KD-20 land attack cruise missiles as well as “a wide range of new precision-guided munitions available from four Chinese weapon manufacturers,” IHS Jane’s Defense Weekly states. To compensate for the relatively small size of its formal naval amphibious transport fleet the PLA has co-funded construction of a large number of ferries used by civilian companies. They will be made available to the PLA during emergencies and are a frequent element in civil-military transport exercises. Large-scale amphibious invasion is one of the most complicated and difficult military operations the PLA might pursue in a cross-Strait contingency. Success would depend upon air and sea superiority, rapid buildup and sustainment of supplies on shore, and uninterrupted support. An attempt to invade Taiwan would strain China’s armed forces and invite international intervention …. China does not appear to be building the conventional amphibious lift required to support such a campaign. Back in January, the PLA also announced that it will double the number of its Amphibious Mechanized Infantry Divisions (AMID) from two to four (see: “China Just Doubled the Size of Its Amphibious Mechanized Infantry Divisions”). Total manpower in the AMIDs will soon be around 52,000 – 60,000, up from 30,000. These new amphibious forces are meant to complement the roughly 20,000 strong elite PLA Marine Corps in future conflicts with Taiwan. The PLA is capable of accomplishing various amphibious operations short of a full-scale invasion of Taiwan. With few overt military preparations beyond routine training, China could launch an invasion of small Taiwan-held islands in the South China Sea such as Pratas or Itu Aba. A PLA invasion of a medium-sized, better defended offshore island such as Matsu or Jinmen is within China’s capabilities. Generational censorship left a story of U.S.-China cooperation, bravery, and sacrifice untold.